Violence, often thought of as ‘frontier justice,’ disproportionately targeted people of color. In April, the Equal Justice Initiative opened the Legacy Museum and the National Memorial for Peace and Justice in Montgomery, Alabama. The museum examines the connections between past and present, the lingering legacy of racial injustice. The memorial remembers the victims of a sustained domestic terror campaign, the thousands of African-Americans who were lynched to maintain white supremacy. Partly educational in nature, partly a sacred space, these long-overdue tributes ask visitors to reflect on the nation’s racist past and consider how racial inequalities continue. In June, the three African-American senators — Cory Booker and Kamala Harris, both Democrats, and Republican Tim Scott — introduced a federal anti-lynching bill, a long-deferred dream of civil rights activists. These developments should invite reflection here in the West, as well, on our region’s history of violence against people of color. Scholars of lynching debate its definition, some even concluding that it is impossible to define. One commonly used, but still contested, definition from 1940 listed several necessary conditions: “There must be legal evidence that a person has been killed, and that he met his death illegally at the hands of a group acting under the pretext of service to justice, race, or tradition.” Because definitions are difficult and evidence elusive, the precise number of lynching victims remains unknown. But the death toll hovers somewhere around 5,000. Illustration of a group of vigilantes in California apprehending a man. In what later became known as “frontier justice,” men banded together to fulfill community obligations, punishing those who transgressed laws. In his provocatively imagined and deeply researched visual history, “Lynching in the West: 1850-1935,” artist Ken Gonzales-Day compiled known lynchings in California from statehood until the last confirmed incident. He counted 352, with the victims including one woman, eight African-Americans, 29 Chinese immigrants, 41 Native people, 120 whites and 132 Latino/as. (He could not determine the race or ethnicity of 22 victims.) Gonzales-Day’s careful calculations raise an important point about lynching: It was not just about African-American victims and did not happen only in the South. Even so, as his list reveals, Western lynching disproportionately targeted people of color. One case Gonzales-Day uncovered happened in fall 1861, just as the Civil War spread in the East. A Los Angeles woman was robbed, stabbed and killed. Shortly after, a mob of white men identified a possible suspect, Francisco Cota, and they dragged him down Alameda Street, stabbing him repeatedly along the way. Before he could die from the beating and wounds, Cota was hanged by a rope. A contemporary newspaper commented: “A butchery such as he committed was enough to stir our citizens to call aloud for instant vengeance. This was no ordinary case. A helpless and feeble woman, a mother, with two little children playing around her, is set upon by this devil in human form, and mangled and mutilated until life is extinct, for the purpose of gain. No death is too horrible for such a monster, and the yawning gates of hell opened to receive him none too soon.” Cota was 15 years old. The lynching occurred just blocks from the Los Angeles sheriff’s office. Legal measures were never explored, much less exhausted. As Gonzales-Day concluded, despite the journalist’s claim, this was an ordinary lynching — racialized, gendered, brutal and lawless. Despite this, Westerners tried hard to portray themselves as different from their Southern counterparts. In 1900, Coloradans lynched three men; two were African-American. According to a recent study by Modupe Labode, a scholar at Indiana University-Purdue University Indianapolis, the lynchers and a sympathetic public saw their actions as something separate from Southern lynching. Coloradans associated Southern lynching with racial violence and lawlessness. What happened in their state, they claimed, was different. They built their rhetoric around the Western vigilante tradition, arguing, along the same lines as Bancroft, that they simply fulfilled a criminal justice function at a time when the state’s courts failed to execute their duty. Coloradans denied that race was even a factor. This reliance on vigilantism, Labode concluded, masked the ways the Colorado lynchings represented “the national culture of white supremacist lynching.” The story from Colorado had cognates across the West. 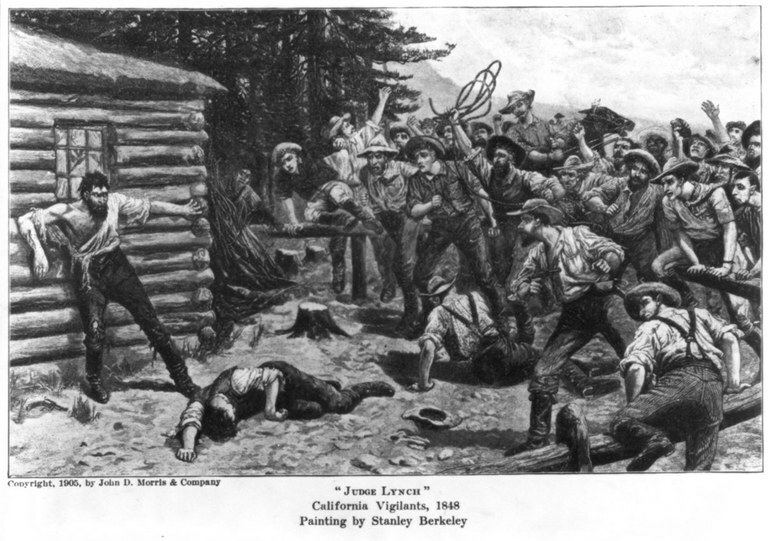 An illustration of the public hanging of Josefa “Juanita” Loazia in Downieville, CA in 1893. She was found guilty of murdering a man, Frederick Cannon, who attempted to assault her. 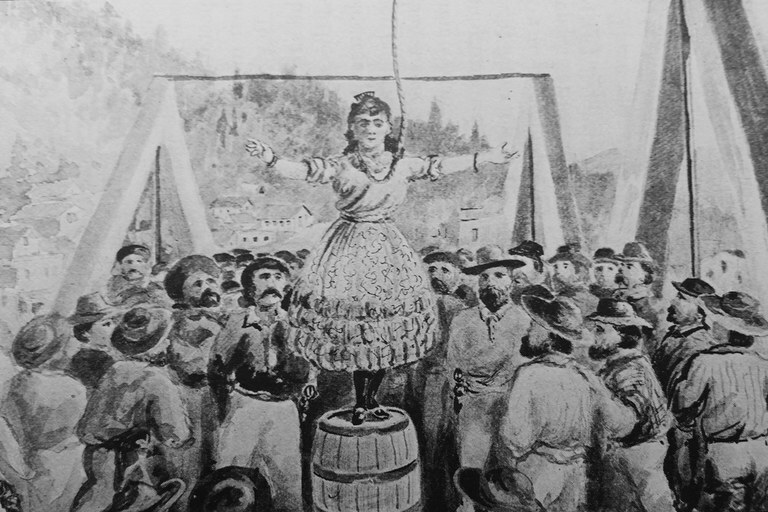 She is known to be the first and only woman to be hanged in California. In 1916, an African-American resident of Phoenix and recent arrival from Georgia said out loud what many thought: “At least they don’t lynch you here, like they did back there.” Compared with the South, Arizona may have seemed safer. In fact, the year before, two white deputies in Arizona’s Pima County hanged two brothers from Mexico, José and Hilario Leon, as alleged outlaws. That was not an unusual act. But then Arizona officials charged, convicted and imprisoned the two deputies. This was an unusual response, one born out of growing fear that the state’s reputation for lawlessness would harm its growth, according to historians William Carrigan and Clive Webb, who chronicled the story for a collection called “Lynching beyond Dixie.” The Leons were not the last victims of lynching, but they were the last Mexican victims. Times, it seemed, were slowly changing. From genocide against Native people to Matthew Shepard’s 1998 murder, violence has been integral to the West. Not all extrajudicial violence fits the lynching definition, just as not all murders are hate crimes. In Western history, the state, not mobs, has been the greatest perpetrator of violence. One leading scholar of lynching, Michael J. Pfeifer, has noted that when states — whether Western, Midwestern or Southern — instituted capital punishment efficiently and racialized the criminal justice system, lynching declined. In other words, capital punishment and mass incarceration combined to serve similar functions. As Bancroft showed, Westerners can easily fall into a trap when they try to distinguish good lynch mobs from bad ones. All lynch mobs are lawless and unjust, and they point to white supremacy — no matter what earlier Westerners might have insisted.